A bad witch's blog: Please Help Support My Book With a Thunderclap! Please Help Support My Book With a Thunderclap! 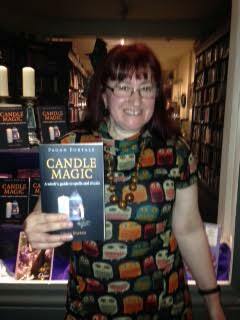 Although you can already buy advance copies of my book Pagan Portals - Candle Magic at Treadwell's store in London, order it online via Treadwell's website or pre-order it via Amazon, the official launch date is February 26th and I would love to mark it with a Thunderclap! Thunderclap is a crowdspeaking platform that helps people be heard by saying something together. It allows a single message to be mass-shared, flash mob-style, and that's what I'm aiming for on launch day. The way you can help be part of this is to click on this link: https://www.thunderclap.it/projects/37263-pagan-portals-candle-magic then click to support my Thunderclap using Facebook, Twitter or Tumblr (just one of those will do, but you can sign up with more than one if you want to). It only takes a couple of seconds. On February 26th at noon, all those people who have signed up to help will then post a one-time message supporting my book automatically. There's no need to do anything else - although I'd be delighted if anyone wanted to also share this blog post to get others to help me too! Any questions, leave a comment or email me at badwitch1234@gmail.com. And thanks in advance to those who join the Thunderclap flashmob!